Inspired by nature, crafted by hand in solid brass. 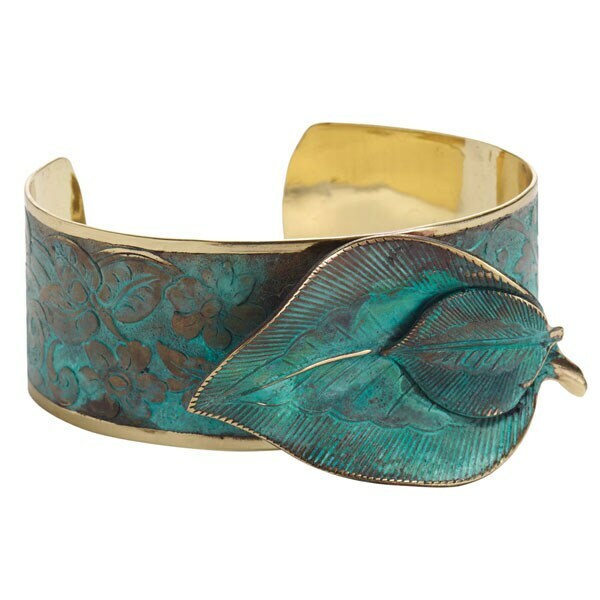 Designed by American jewelry artist Elaine Coyne, beautifully shaped and detailed leaves feature her signature verdigris patina and polished-to-a-gleam finishing touches. Cuff bracelet (XB1992) with nested leaves is 1" wide and slightly adjustable. Necklace (XB2002) is two leaves—large 2 1/8", small 1"— on a double strand of leather; adjusts 16-18". Earrings (XB2012) hang 5/8" on gold-plated leverbacks. All made in USA. Sold separately.